New rules on whale hunts should stop killing for junk science. Portoroz, Slovenia - The killing of whales as part of scientific research programmes will now be under stricter oversight after a divisive vote by the International Whaling Commission (IWC) today. The decision comes after a judgement by the International Court of Justice (ICJ) in March that ruled previous “scientific” hunts by Japan to be illegal. The resolution, put forward by New Zealand, passed by a simple majority of 35 for and 20 against. 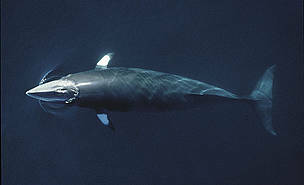 Japan and other whaling nations voted against the proposal, which leaves the measures unbinding on them under treaty rules. Disturbingly, Japan says it will restart its “scientific” whale hunt next year in defiance of the IWC resolution. A moratorium prohibiting commercial whaling has been in effect since 1986, but Japan has continued to hunt thousands of whales by claiming that it was conducting scientific research. Today’s resolution gives a larger role to the commission in evaluating the legitimacy of scientific whaling proposals, as requested in the ICJ judgement.